A meeting was convened at the Rajiv Gandhi University the primer educational institution of the state located at Rono Hills hardly two kilometre from the Emchi Tinali in Doimukh and the Rajiv Gandhi University Students Union (RGUSU) have been pressing hard and demanding for immediate renovation of the said road for the convenient of thousands of students of the versity, they also threatened to stop the admission process of the university to be started shortlyfor which a resolution was adopted recently. On the backdrop of the demand placed by the students union to the state government of ten days and the passing of the deadline day by day it was felt necessary to have complete renovation of the said stretch of road at the earliest while students leaders were feeling hard as the state government was not listening to their genuine demand. 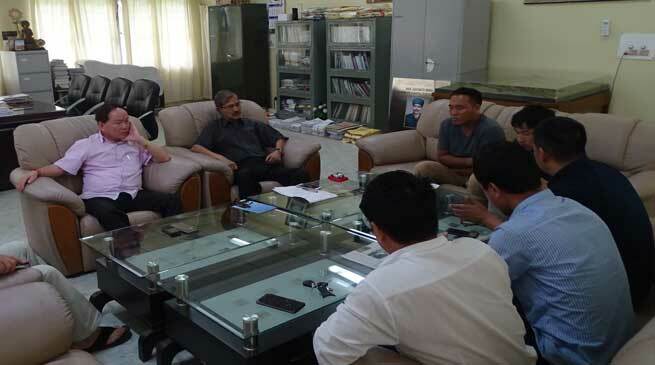 Doimukh local MLA and Minister Urban Development, Land Management etc Nabam Rebia today discussed the matter thoroughly with the RGU authority and students union leaders of RGU at the office chamber of the RGU Vice Chancellor Professor Tamo Mibang wherein Joint Registrar Dr, Nani Tamang Jose, PWD Doimukh Division Executive Engineer Nabam Tado, Power Yupia Division Executive Engineer Ajay Murtem, and AAPSU, VP (Protocol) Tayuk Sonam, RGUSU General Secretary Prem Taba, IPR Secretary Toko Rika and others attended the hour long meeting today. The students leader presented their grievances with regards to road connectivity and pathetic condition of the present road of the University for which the students are planning to protest by way of their own style. While PWD EE resented detail of the action taken right from meeting with the former Governor JP Rajkhowa to till date and fund provision for renovation of road from Bage Tinali to Harmuty and Kola camp and other issue and award of the said road to NHIDCL and other issue. Minister Rebia while said that since the RGU is one of the premier University of the state. as I am the local elected representative of the are and also cabinet Minister in the government need to inform any problem first and he shall certainly do something any way as university belongs to all and road connectivity shall certainly taken up. Since there is lots of rainfall due to south west monsoon even though the potholes of the road from Emchi Tinali to RGU gate shall be taken up from tomorrow while the carpeting will be done in month of September 2017. Rebia while appealing the students leaders to be a part of development of state and everything need to be discussed at an appropriate level before going to mass media, he also said that he have directed the PWD EE to start filing of potholes from tomorrow while on alternate road to RGU issue Rebia said that a proposal prepared by PWD have been sent to government for consideration and once approved it will be a bone for the versity in connectivity issue.VC Professor Mibang while appeal the student and the Minister to immediately take up the repairing and few other issue from time to time in the interest of the education sector while Rebia assured his full cooperation for the lone premier university of state.